Hot Towel Cabinets - 18 litre. Hot Towel Warmers suitable for use in Salons (Beauty, Barber, Massage), Spas, Restaurants and Medical. Hot Towel Cabinet - 18 litre. Door opens from top to bottom. (#CAPR018A). Sorry - this item is not available. Contains 2 detachable netal baskets. 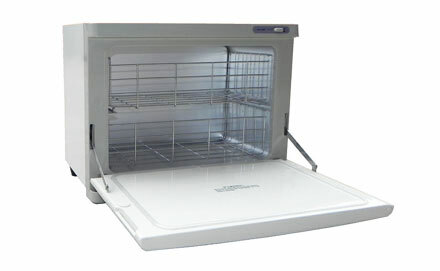 Maximum heat achieved is 70 - 80° C.
Plastic drip tray which is removable. Front loading door opens downwards. Power rating - 240 volts, 50 Hz, 180 watts. Electrical connection comes with Australian plug. Used mainly for Face Towels. The unit handles them whether dry or wet. We can organise to send these Warmers to be delivered anywhere within Australia. PayPal, Visa, and Mastercard accepted as payment. Cheque and internet banking also available. Want more information on any product, call us on (02) 6162 1950 or email us. * Equipment is on display for demonstration at our Canberra store between Monday to Saturday.